Many of you have been waiting for the perfect combination of a Windows tablet PC that also converts to a laptop. People still love using iPads and Android tablets for information consumption, but nothing beats the accuracy and the usability of an active digitizer pen (such as the Wacom pen) when you're standing by the patient's bedside and jotting down notes in digital ink so that they can converted into type. Older 1st and 2nd generation Atom-based tablet PCs have been very thin and light, but relatively slow and sluggish in their performance. Upgrading to a heavier tablet like the Surface Pro 2 provides ample horsepower at the expense of a very tired arm that's been holding a 2-pound tablet all day. When's the winning combination going to arrive? For me, the winning combination would be 1 to 1.3 pounds for the tablet, 5+ hrs of real-world battery life, support a Wacom digitizer, and dock into a backlit keyboard that has adjustable viewing angles (not a fixed viewing angle keyboard dock). A power keyboard that includes an integrated battery is a plus, but not an essential feature. Although the Lenovo ThinkPad 10 looks promising, it's still missing some critical features in my opinion: the keyboard dock is not backlit and it's a fixed angle keyboard. Otherwise, the ThinkPad 10 has almost everything else I'd be looking for in a light, thin tablet. The Surface Pro 3 is another possible option if you're willing to use something a bit larger and heavier. The 612 will have a 12.5" screen and weigh 2.22 pounds (tablet only). 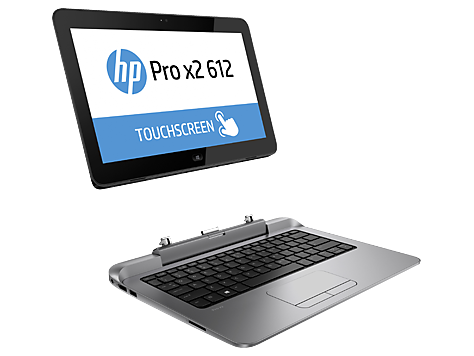 Thankfully, HP is going back to a Wacom-based digitizer on the 612. I suspect their experience with Atmel led them to return to Wacom. The 612 will dock into a backlit keyboard or a keyboard that includes an internal battery to extend overall battery life. The tablet + power keyboard will weigh 4.09 pounds. The 410 has an 11.6" screen and weighs 1.8 pounds (tablet only). Unfortunately, the 410 does not include an active digitizer and it only comes with a standard keyboard dock (no backlit keys, no internal battery option). To me, the 410 sounds more like a consumer device and the 612 is a true business/professional device. So, the 612 could be a real winner, but at 2.22 pounds for the tablet, that may just be an arm-buster for some. You can justify the heavier weight since you're getting 12.5" of screen space. By comparison, the Surface Pro 2 weighs 2 pounds but you're only getting 10.6" of screen space. The new Surface Pro 3 weighs 1.76 pounds and provides 12" of screen space. Microsoft was able to make a thinner, larger Surface Pro 3 and reduce the weight. Impressive. I'm still waiting for that ideal combination of a thin, light (1 to 1.3 lbs) tablet that supports an active digitizer pen. The ThinkPad 10 may be the closest thing to that right now, but I'll continue to wait because I'm certain that someone will come out with one soon. Maybe it'll be a Windows 9 tablet.